The 26th Edition of the National Mixology Challenge 2018, Sri Lanka’s most competitive and fiercely fought ‘Battle of the Bartenders’, plays out from 9 July to 11 September. The preliminary stage of competition, currently being held in seven regions across the island, has been a revelation in terms of emerging skill and flair in the bartending arena, according to the panel of judges. 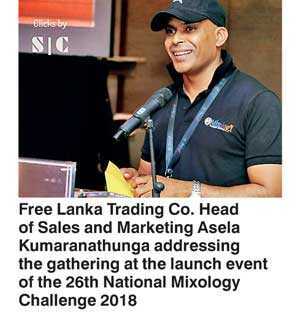 The Grand Finale of the National Mixology Challenge 2018 is scheduled for 11 September at the Kingsbury, Colombo. Featured will be the Semi-Final round winners in an exciting showdown for the titles of Champion in two categories, namely the Classical Challenge and Flaring Challenge. This competition is being organised for the 26th consecutive year by Free Lanka Trading Company Ltd., a name synonymous with the import of fine wines and spirits for over three decades, in conjunction with The Hotels Association of Sri Lanka (THASL). Principle sponsors are Gruppo Campari and Marie Brizard International. The preliminary rounds of competition have commenced in seven regions, namely Colombo, Negombo, Down South, Deep South, Kandy, the Cultural Triangle and North East. Open to all personnel employed in any bar tending capacity by Sri Lanka Tourism Development Authority approved hotels, restaurants and other catering establishments, it provides them with the perfect platform to show off their creative blending skills and mind-blowing presentations. At a time when Sri Lanka is focusing on developing its tourism trade, competitions such as this provide much needed motivation for the youth of today to join the hospitality trade, where there is a dearth of qualified manpower. The panel of judges for the regional competitions comprises of eminent personalities in the beverage sector from Sri Lanka and overseas. The seven regional winners will be awarded scholarships to follow the WSET Level 1 training program in Spirits courtesy of Free Lanka Trading Co. Ltd. This training course and examination, valued at Rs. 150,000 per participant, will be conducted by the Wines & Spirits Education Trust (WSET) UK (www.wset.com), with all successful candidates receiving the UK Certificate. It will be conducted in Colombo alongside the Semi Final Training programme of the 26th National Mixology Challenge 2018. The Award Ceremony on 21 September at Shangri-La, Colombo, will be an exclusive invitees-only event where the winners will be awarded cash rewards, prizes and trophies. In addition, the winner of the Classical Challenge will get an opportunity to travel to France and represent Sri Lanka in the “Marie Brizard Masters 2018” in Bordeaux, France. Participating in the 26th National Mixology Challenge 2018 will bring the winners head on with other competitors from the rest of the world, and also provide them with opportunities for improvement based on advice from foreign experts and their own experiences in France.